Burgess Hill 1st XI took their winning run to five games in beating a strong Brighton and Hove 2nd XI at St John’s. With the pitch looking good and the sun beating down it was no surprise when Hill skipper Joe Maskell won the toss and elected to bat. Ben Hopkins and Tom Trowbridge faced a very decent opening new ball pair of the experienced Christopher Atherton and Kieran Buck and both batsmen looked tidy in the face of good bowling especially Hopkins who drove powerfully down the ground. Buck took the first wicket with Trowbridge unluckily caught in front by one that kept very low. Hopkins followed shortly after when he was caught off Atherton, then both Ian Simpson and Kevin Ramsay got in then out before reaching 20 as B&H turned the screw with Atherton and the wily Dave Mates doing the damage. When Nathan Cooper was bowled first ball by Atherton suddenly Burgess Hill were 72-5 and the game very much in the balance. However Tom Penfold (56), who has had a brilliant first half of the season, and skipper Maskell rebuilt the BHCC innings firstly by resolutely defending their wickets then timing the acceleration perfectly in a brilliant partnership of 118 before Penfold was stumped off Hardwick. Maskell continued to play his shots while wickets fell at the other end and when he was finally out for an excellent 70 Hill had 224 runs on the board which looked about par. Maskell and George Willett opened the BHCC bowling and Maskell had immediate reward when Hardwick was expertly caught by Kevin Ramsay standing up and then Willett bowled Curtis Ford. 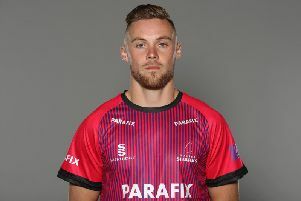 Brighton needed all-rounder Atherton to build a big innings and initially he looked in good form with aggressive shots from the off alongside Duncan Jenkinson. However Willett (3-39) was bowling in good areas and with sharp pace and he accounted for the pair, bowling both. Atherton was unlucky as another ball kept a little low but Jenkinson was bowled emphatically. A brief revival followed but BHCC tails were quickly back up when Jake Wilkinson was cleverly run out by Tom Trowbridge, and then Guy Williamson was smartly caught by Matt Charman off the bowling of Lewis Mamoany. Peter Billinghay then bowled Fergus Guppy and it was now a case of BHCC getting the remaining wickets. This they did in fine style, firstly with Matt Charman removing Buck off his first ball, before Maskell (3-16) returned to finish the tail as B&H ended 119 all out and BHCC taking the full 30 points.